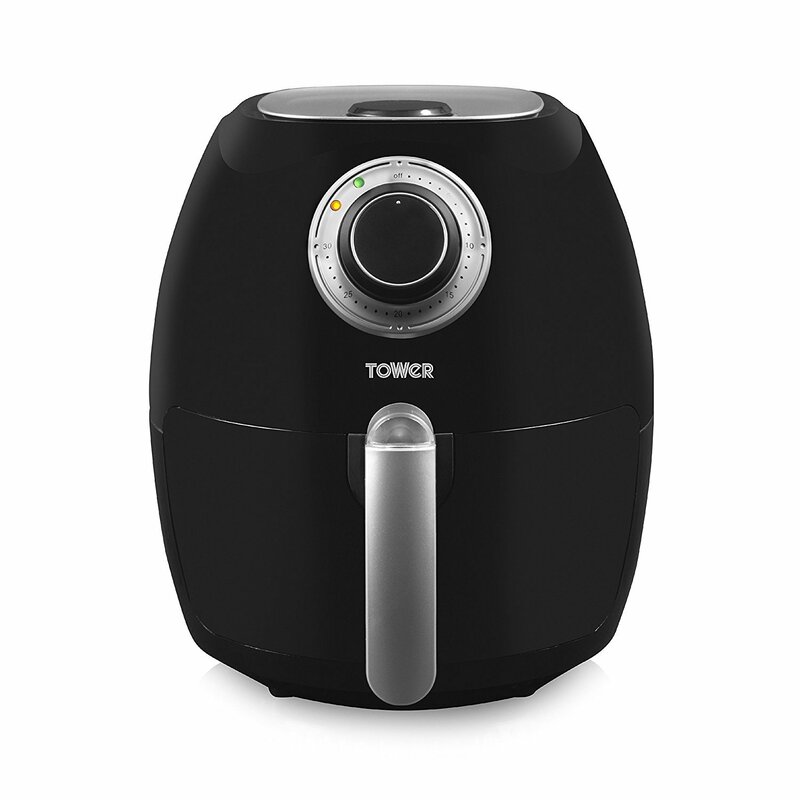 1.1 Why should you consider buying a tower air fryer for your home? 1.2 What should you look for, when buying an air fryer? Thanks to weight loss plans like Slimming World and Weight Watchers endorsing them, air fryers have become hugely popular in recent years. Not only are they great for those who are trying to follow a strict diet for weight loss, but they have also become almost trendy to have in the home. Why should you consider buying a tower air fryer for your home? What many people may not be aware of is the fact that there are so many benefits that come to cooking with an air fryer, as opposed to a traditional deep fat fryer. The main advantage is that there is little to no oil used in the cooking process. Here are a couple of the other benefits to be aware of. Healthier Fried Food – We all enjoy fried food every now and again. However, the problem is that when consumed in large quantities, it really can be quite bad for you. By cooking your fried food in an air fryer, you are able to make the food with up to 80% less fat. You will only have to use a little oil in order to get the desired results, meaning that you can still enjoy fried food. Fast Food at Home – We all enjoy a takeaway in this country, without a doubt. However, along with all of the additives that are used, there is the fact that a lot of takeaway food will have been deep fat fried, which is very unhealthy. By using an air fryer at home, you are able to enjoy takeaway style food with a fraction of the fat content, making it much healthier for the whole family. Less Heat in the Kitchen – If you have a relatively small kitchen, then one of the things that you will have probably noticed is that a deep fat fryer will throw out a lot of heat. This can make cooking and food preparation unbearable. If this has been a problem for you, then an air fryer may be the perfect solution as they don’t throw out much heat at all. What should you look for, when buying an air fryer? If you are going to be buying an air fryer, and you want to make sure that you have chosen the one that is going to give you the best results, then there are a few points that you should keep in mind. Here are a few suggestions. What Features Does it Offer? 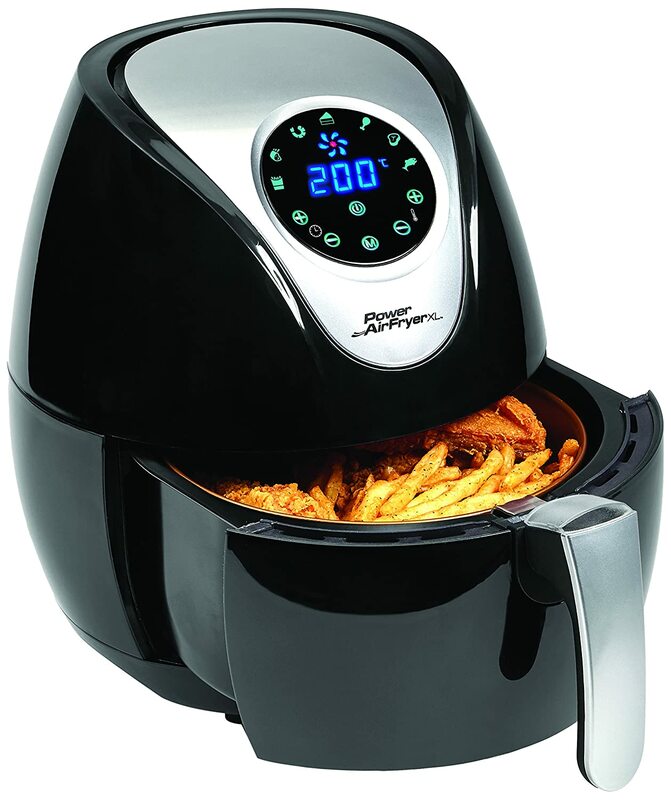 – This is definitely the first thing that you should be looking at, when buying a tower air fryer. You should take a look to see if it has a timer, adjustable temperature settings, and different cooking methods. Not all of these features are essential, but they will give you a better idea of what to expect and how to get the most out of your air fryer. Is it Dishwasher Safe? – One of the things that a lot of people like about tower air fryers is the fact that they are a lot easier to clean because of the lack of oil involved in the cooking process. However, when looking at different air fryers, it is a good idea to see if it has removable components that are dishwasher safe. Check the Capacity – Again, this is very important. You need to consider how many people you are going to be cooking for, using your air fryer. If it is only you that is going to be using it, then something with a small capacity should be fine. However, if you are going to be catering for the whole family, then you will want to make sure that you get a tower air fryer with a large capacity. In order to help you to find the best tower air fryer for you, we have compiled a list of reviews of our top 5. Take a look below and see if any of them stand out for you. For a versatile tower air fryer that is incredibly user friendly, this model from VonChef is a great option to consider. It allows you to cook your food with an impressive 80% less fat than traditional frying methods. You can cook a huge amount of different food including chips, fried chicken and even cupcakes. The detachable non-stick basket offers easy cleaning and it is also dishwasher safe. With a 2.5l capacity, this VonChef air fryer is perfect for catering for the whole family. It has a 60-minute timer, so you can fry your food to perfection every time. It has a stylish design, so it would look perfect in a modern kitchen. It is a great option for those who are new to air frying. May not be advanced enough for experienced cooks. May be slightly too big for just one person. Overall, this is a great option to consider if you are new to air frying or cooking in general. 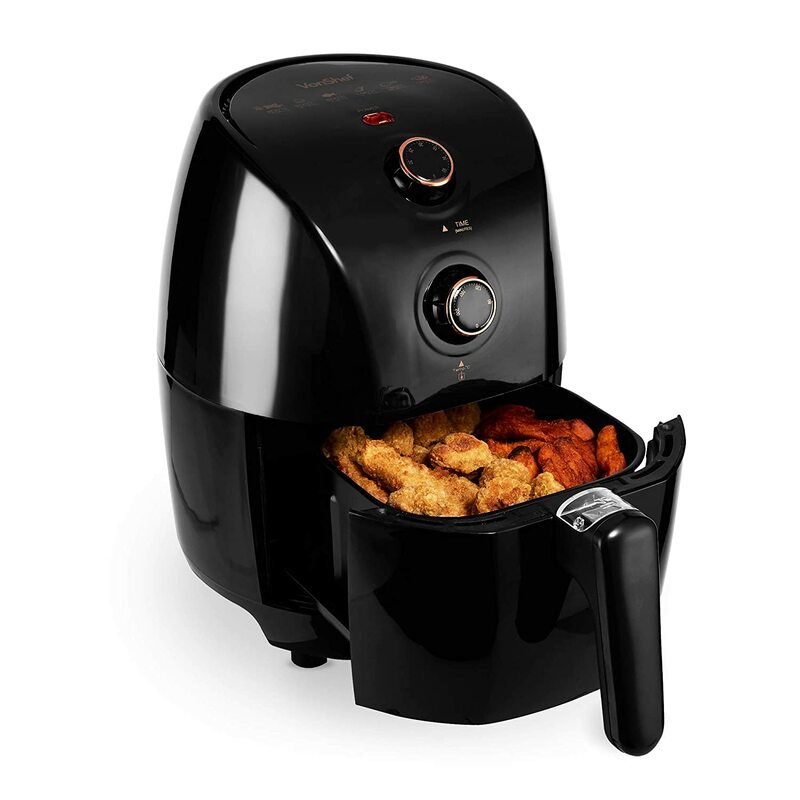 This tower air fryer is perfect for those who like to get creative in the kitchen. You can cook so many different things in this air fryer, including spring rolls, prawns, cod and even desserts. It has rapid cooking capabilities, so you can fry your food in a fraction of the time whilst keeping it healthy and low fat. With a 2.2L capacity, it is ideal for cooking for the family with ease. It is highly user friendly and the control panel allows you to choose from the many different cooking options. It is incredibly versatile and allows you to cook many different types of food. Very modern design so would be great in the kitchen of a modern home. It is slightly too big to cook for just one person. It may be a little too advanced for beginners to get to grips with. If you have used a tower air fryer before, and you feel confident in the kitchen, then this may be a good air fryer for you to consider. If you want a tower air fryer that packs a punch, then this may be the one for you. With an impressive 3.2L capacity, you can cook for large groups of people with very little hassle. It has five different cooking methods including sauté, roasting, grilling and more. The great thing about this particular tower air fryer is the fact that as well as 5 cooking modes, it also has 7 different programs, so you can cook perfectly with ease. If you are looking for something that is going to be powerful enough to cook in big quantities, this is it. This fryer is very easy to clean. No excess grease on the food once it is cooked. The fryer is very big, so won’t be well suited to smaller kitchens. Food needs to be turned during cooking for an even fry. For a powerful air fryer with plenty of customisable cooking options, this is definitely a model worth considering. Breville is a huge name in the kitchen appliance business, and with good reason. 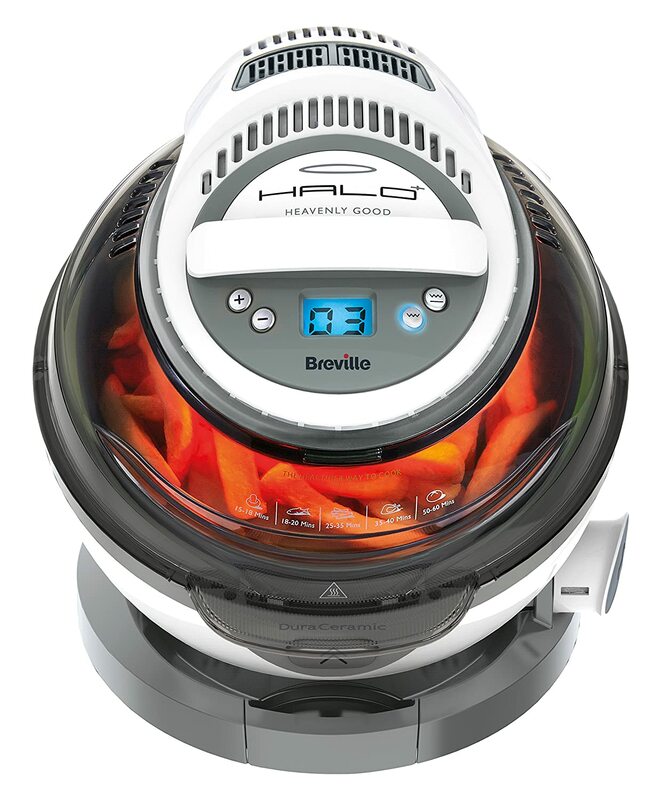 With a Breville product, you can guarantee high quality, and this air fryer is no exception. It only requires half a tablespoon of oil to cook an impressive 1kg of chips, which is easily enough for several people. As well as this, there is no oil required for cooking frozen foods. The biggest plus point that comes with this Breville air fryer is the fact that it has a unique tilt function. This allows for precise even cooking, something that not all air fryers are able to offer. 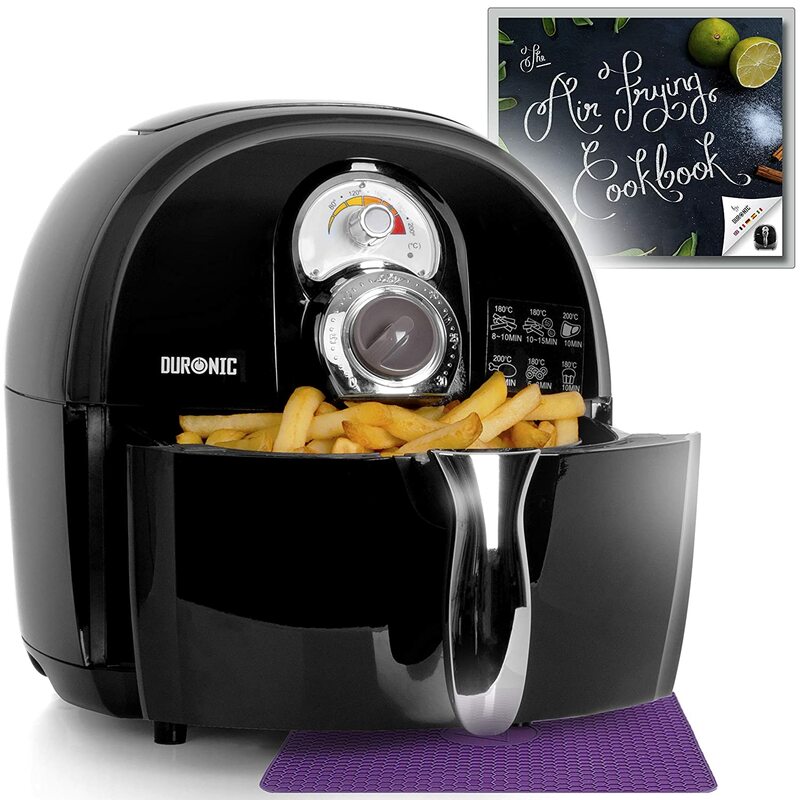 There are several extras with this air fryer including a roasting rack, measuring spoon, cooking guides and recipes. Lots of different features for the more advanced cook. Slightly smaller capacity than most of the other air fryers on the market. If you don’t mind the smaller capacity, then this unique air fryer could be a great addition to your kitchen. This is number one on our list. It has a 3.2L capacity which is enough for 5 portions of food, so it is perfect for cooking for the whole family. With swift air circulation, you can guarantee efficient cooking each and every time. One of the best things about this particular tower air fryer is the fact that it can be used alongside the Alexa app. This air fryer is technologically advanced to say the least. It is packed with different features and programs, so perfect for cooks of all abilities. Can be used alongside the Alexa app. Big enough for cooking for the whole family. Quite big in size, so won’t be suitable for those lacking space in the kitchen. If you are looking for an air fryer that combines practicality with high-end technology, this is the one for you. There are so many great tower air fryers on the market at the moment, and these are our top 5. Take a look through all of them and see which ones appeal to you. By taking your time to buy an air fryer, you can make sure that you get the best results possible.